(Bloomberg Opinion) -- Once the genie’s out of the bottle, it’s impossible to put back in. China has discovered predatory online cash loans, and even an appearance on the state broadcaster’s annual consumer rights program is unlikely to eradicate the practice. In its two-hour special on March 15, China Central Television interviewed a woman whose debt ballooned to 500,000 yuan ($74,417) in just three months, from an initial 7,000 yuan. She was lured into taking out a “714 missile” loan, so-called because they’re typically due in seven or 14 days. At first, the woman took out a 1,500 yuan loan online, at an advertised interest rate of 0.6 percent per day. The actual amount received was only 1,050 yuan, though, because the lender charged 450 yuan in “upfront fees.” The borrower was sucked into taking out more of these “missiles” to pay off old ones because overdue charges, at 5 percent per day, were even more onerous. Failure to pay would have been punished by the lender making calls to family and friends (borrowers must give the finance company access to their phone contact list). China started to clean up its runaway payday loan businesses as early as December 2017 with a set of new regulations. This January, the government further tightened controls, pushing the risky peer-to-peer platforms out of the industry and the rest into plain-vanilla loan facilitators – online marketplaces that gather information on borrowers and lenders. The outstanding balance of P2P lending shrank to 751 billion yuan in February, from 1.3 trillion yuan in June. There’s no hard data on 714 missile lending, and many payday lenders have gone underground. None of this business is legal: Beijing has made it clear that the maximum legal interest rates online lenders can charge is 36 percent annually, with no add-on fees. CCTV said some consumers were tricked into taking out the loans, but online chat rooms suggest many may be willing borrowers. To put things in perspective, these loans tend to be small, in the range of 1,000 yuan to 2,000 yuan. If you’re a cash-strapped small shop owner, you may well prefer to turn to online loan sharks rather than family and friends. Just taking relatives out for dinner – to thank them for their help – can end up exceeding the upfront costs, not to mention the loss of face. Once taboo, borrowing to spend has crept into China’s modern consumer culture. In the P2P subset alone, the number of borrowers ballooned to 43 million in 2017, from 14 million a year earlier. This pent-up demand had to go somewhere. China has a broken credit multiplier. 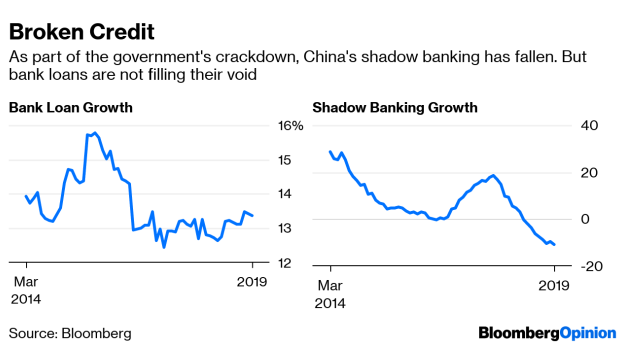 Bank loans aren’t growing fast enough to fill the void left by shadow financiers, which Beijing is still curtailing. In an economic slowdown, banks are reluctant to lend to private businesses, let alone subprime consumers. The latest statistics show that the shadow-banking crackdown may be working. But in reality, many small businesses and consumers with unstable incomes are just being pushed into the online undergrowth. As long as that’s the case, payday loans aren’t going away.